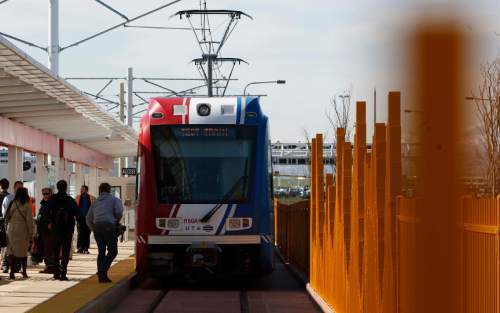 Leah Hogsten | Tribune file photo The TRAX light rail system has a 92 percent on-time track record, according to the Utah Transit Authority. That's slightly better than buses, but not quite as good as FrontRunner commuter rail. Steve Griffin | Tribune file photo UTA buses have a better than 90 percent on-time rate, according to agency data. That represents a huge improvement in recent years and officials credit it to technology and planning. 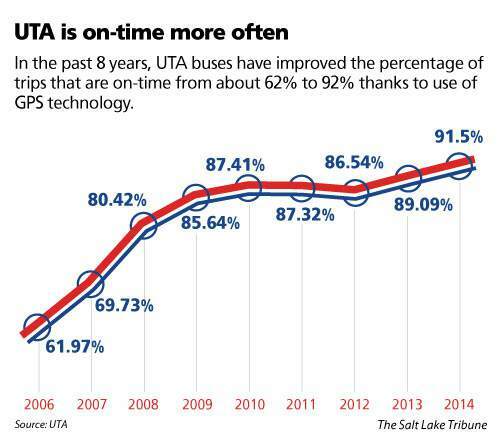 UTA is on-time more often In the past 8 years, UTA buses have improved the percentage of trips that are on-time from about 62% to 92% thanks to use of GPS technology. Scott Sommerdorf | Tribune file photo The FrontRunner commuter train is among many railroads nationwide likely to miss a Dec. 31 deadline for installing new safety features mandated by Congress. The system could have prevented last month's deadly Amtrak derailment in Philadelphia. Michael Howe began commuting daily on TRAX about six years ago when he was a University of Utah student. 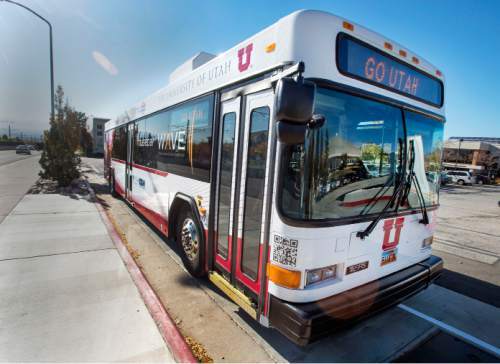 He&apos;s observed something that the Utah Transit Authority has worked hard to improve, but few likely have consciously noticed. "If there&apos;s nothing out of the ordinary going on  like an accident  it&apos;s usually right on time," says the West Valley City resident. Transit wasn&apos;t always that way here. 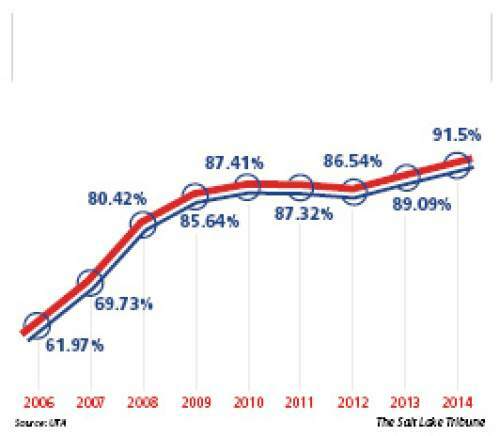 In fact, in 2006, UTA buses met schedules only 62 percent of the time. Last year, for the first time ever, the on-time rate for UTA buses was better than 90 percent  91.5 percent to be exact  even though UTA has adopted tougher definitions for being "on time." That&apos;s an improvement of 30 percentage points in eight years. If letter grades were given, that would be jumping from a D-minus to an A-minus. TRAX light-rail trains last year had an on-time rate that was slightly better than buses, 92 percent. 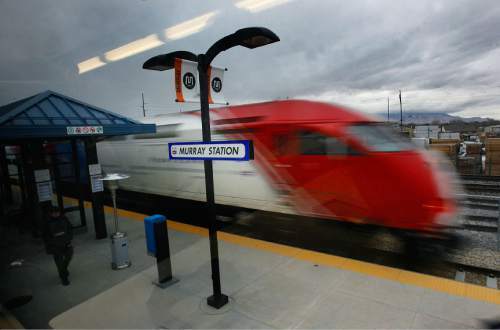 And the rate was best of all for FrontRunner commuter trains, with 94.6 percent coming in on time. Secret sauce • So how has UTA scored such big gains in recent years? "It is mostly through the use of technology," says Jerry Benson, UTA vice president for operations. The agency put GPS systems on all buses and trains to track and report their locations in real time. The information is stored to evaluate performance. UTA also loads schedules into computers showing when a bus or train should be at each stop, and compares that to onboard clocks and actual location of buses. Benson says displays in vehicles constantly show operators how close they are to the schedule. "So if you&apos;ve been on a bus and had the operator pull over somewhere besides a bus stop, it may be because they are a little ahead of schedule." It allows UTA to judge how well individual operators perform and to require them to meet standards for on-time performance. Performance data also enable supervisors to research what may throw off operations in some areas, and make more accurate schedules. "We can look at every trip, every day, every hour" to discover where problems lie, Benson says. "Managers can drill down to see if it is a vehicle that is struggling, or specific trip that maybe there are a lot of wheelchair boardings, or there are differences in operators." With that, they often tweak schedules  finding that the same route may take longer during various hours of the day or seasons of the year. "They may also see that for this six-block segment, I have more time than I need. So I can take 30 seconds out of that segment and I can put it in another area where we start to fall behind," Benson says. "That&apos;s a much more refined level of scheduling than we have ever been able to do before." Stop by stop • Improvements have come as UTA actually raised the standard of what it considers to be on time. For example, it used to look just at whether a bus or train reached the end of the line on time. "We switched to measuring on-time performance at every station." UTA also used to give more leeway about exactly what on stime meant at any given point. Now, a bus or train is not considered on time unless it leaves a stop "between zero seconds early and no more than 4 minutes and 59 seconds late." That is a much tighter window than is used by many other large transit agencies. For example, Metro in Washington, D.C., considers buses or trains "on time" if they leave between two minutes early and seven minutes late, and MARTA in Atlanta considers them on time if they are between 30 seconds early and 5.5 minutes late. "Our measure matches customer expectations," Benson says. "Having your train or bus leave early is never a good thing" because people can easily miss them. "Five minutes late, you can kind of live with." Also, "If I&apos;m a customer standing at a station, it doesn&apos;t matter to me if the bus gets back on time by the end of the route. What matters to me is if you are on time when I am at my stop." National leader? • UTA is proud of the improvement. The agency&apos;s president and CEO, Michael Allegra, even told its board last month that "UTA is the national leader in on-time performance." That is hard to measure, however. Benson notes that transit agencies have various standards for what they consider as on time, and the statistic is not something that is gathered nationally for evaluation and comparison. But Benson believes the only transit agencies that have better statistics for buses, for example, are those with "bus-rapid transit" systems. "That&apos;s more like light rail. They have [traffic] signal priority and a dedicated right of way," a lane of their own on roads, so they don&apos;t have to fight congestion that regular buses face. Benson also figures UTA&apos;s timeliness may have escaped the attention of most people. "It&apos;s like asking if you noticed that the lights went on when you flipped the switch," Benson says. "It&apos;s just something people normally expect." UTA has goals to do even better. Benson wants bus reliability to hit about 95 percent  which he says may be the best that can be expected with traffic and weather issues. He wants the train systems, which can more easily escape congestion, to achieve about 98 percent reliability. There definitely is room for improvement, he says. "Ninety percent sounds really good. But if you use transit every day, that&apos;s 10 one-way trips a week. That means one of those 10 is not on time," Benson says. "That&apos;s still not good enough."